The idea of having bi folding doors with blinds is not a new one, but it has some real advantages. Enclosing the integral blinds inside the folding doors means that you do not have the problem of flapping blinds when the door is opened and closed. Another feature is that the blinds allow privacy, neatness and cleanliness. 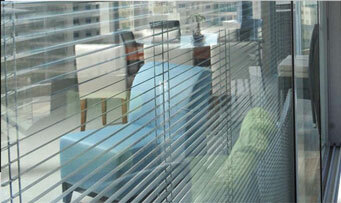 Having the blinds inside the glass means that there is a real space saving to add to the room’s neatness and design. 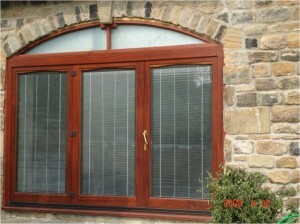 Why use Bi Folding Doors With Blinds? Bi folding doors with blinds inside is suited to many types of room, but a conservatory or sun room will allow them to show why they are a definite asset. The versatility of Bi folding doors with blinds inside adds privacy, light control, with a real touch of style. They have all the advantages that a door and the blind will have without the bulkiness, rattling noise when the door closes or swings in the wind. Sunshade Blinds can supply Bi folding doors with blinds inside as well as sliding patio doors that will provide an eye-catching impact to the exterior of any home. This door system is thermally strong, with the ability to create a dramatic large area of glass without reducing thermal or weather resistance and they can take all types of sealed units with blinds inside that we manufacture. In addition, integrated blinds can be fitted to normal UPVC entrance doors, bi-folding doors and any door that has an integral square of oblong window to take the blinds in double glazed units. If you are double glazing fitter and you are interested in supplying bi folding doors with blinds to your customers, why not telephone us on 0800 310 12 22 or contact us be email you will not be disappointed.